I’m just finishing up a long stretch at work and feeling drained. On the plus side, I am feeling much stronger (and faster!) when I ride my bike to work now. Not only that, but I’m actually enjoying it. When I first started, I knew it was good for me, the earth, and my checkbook, but I just didn’t like it. It was hard. Sometimes you have to “fake it till you make it.” Maybe it’s the much awaited sunshine, but I couldn’t help myself from just smiling every time I got on the bike! The down side? I’m so exhausted that I took an extra “rest day” off from working out today. I usually only take one day off a week, but today I thought I was going for a run and ended up mostly walking. My legs are sore and my energy is low. I hate messing up my schedule, but I have to respect my body. Other exciting news? My bestie, Michelle, arrived in Portland Sunday! We are now about a 25 minute walk away- much easier than a 4 day car ride or 4.5 hour plane ride. As I mentioned, she is newly gluten-free and I have been making lots of gluten-free treats. I don’t follow a strictly gluten-free diet, but I do enjoy trying new grains and grain alternatives. I feel best when I eat a variety of grains such as rice, quinoa, oats, kasha, and millet instead of just all wheat. 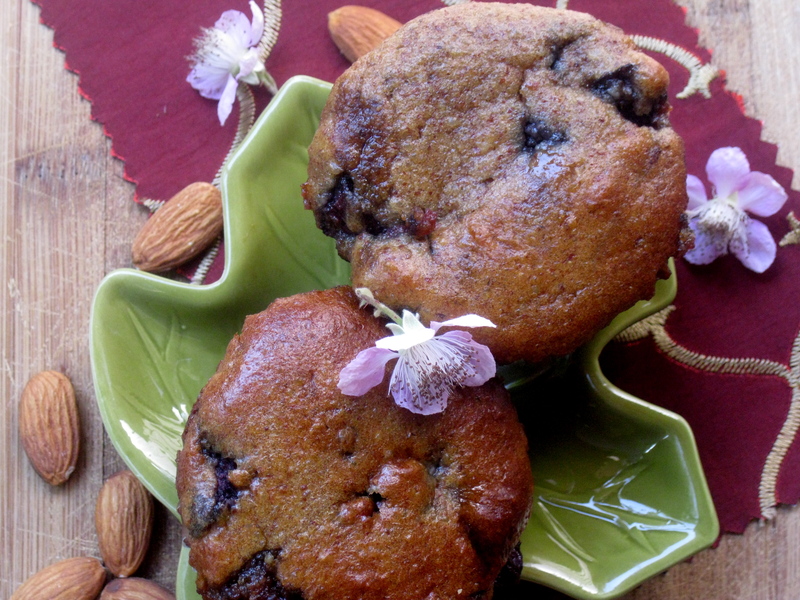 These muffins are actually made with almond flour and are low carb, high protein (a whopping 9 grams per muffin! ), and packed with nutrients. I don’t buy almond flour as it is quite expensive. I simply grind whole almonds in my coffee grinder and…voila! Almond flour. Almonds are high in protein, fiber, vitamin e, calcium, and magnesium. The best part? They taste amazing! Andrew wrote me a love letter after eating one when he came home the night I made them. The phrase “most delicious muffins I have EVER tasted” was used. But it gets better! They are also ridiculously simple and easy to make. I slightly adapted a genius recipe from Elana for a simple almond flour muffin that she created as part of the “Gluten-free Ratio Rally.” Her basic recipe has just five ingredients, though I changed it up slightly with the additions I made. The “bomb” is the homemade cherry jam surprise inside, and I also stirred some chopped cherries into the batter, as well as chocolate chips in half of the muffins. 1. Line 8 standard muffin tins with paper cups, or grease them. Preheat oven to 350F. 2. Combine wet ingredients (eggs, agave, vinegar, almond extract). Stir in almond flour and baking soda. Fold in chopped cherries and chocolate chips if using. 3. Pour batter into prepared muffin tins, only about half full. Spoon 1 tablespoon of cherry jam into each, then cover with the remaining batter. 4. Bake for about 15 minutes, or until puffed and golden. Cool and enjoy! I’m off to enjoy some much needed sunshine! Have a beautiful day! Usually I try to eat in a way that nourishes my body, choosing foods which are high in vitamins and minerals and striving for a healthy ratio of carbohydrates, proteins, and fats. However, sometimes those chocolate cravings come knocking and there is nothing I can do but satiate them! This morning and yesterday morning were some of those mornings which I found myself with a desire for nothing else but chocolate… Blame it on PMS if you will. But knowing this was probably the cause of my craving also inspired me to create a meal that not only satisfied my craving, but provided the nutrients my body needs most at this time. I have put together two great tasting a phytonutrient packed smoothies that are healthy and delicious for anyone, but specifically formulated to give women’s bodies both what they want and what they need. The above photo is of my favorite variation: Chocolate-Cherry. I used to think I hated that combination because all I had tried were those terrible cherry cordial candies… but I have since discovered Chocolate- Cherry is quite delicious! 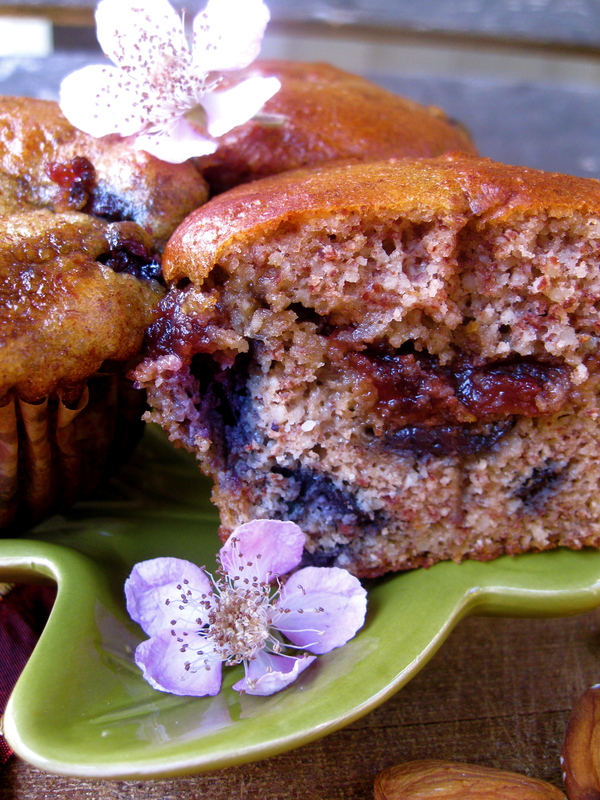 *1 tablespoon ground flaxseed or 1 teaspoon chia seeds. * Stevia, agave, or your favorite sweetener to taste. Directions: Layer ingredients in high speed blender in the order given (at least make sure you add the greens first) and blend away! Taste before you pour to determine how much sweetener you want. 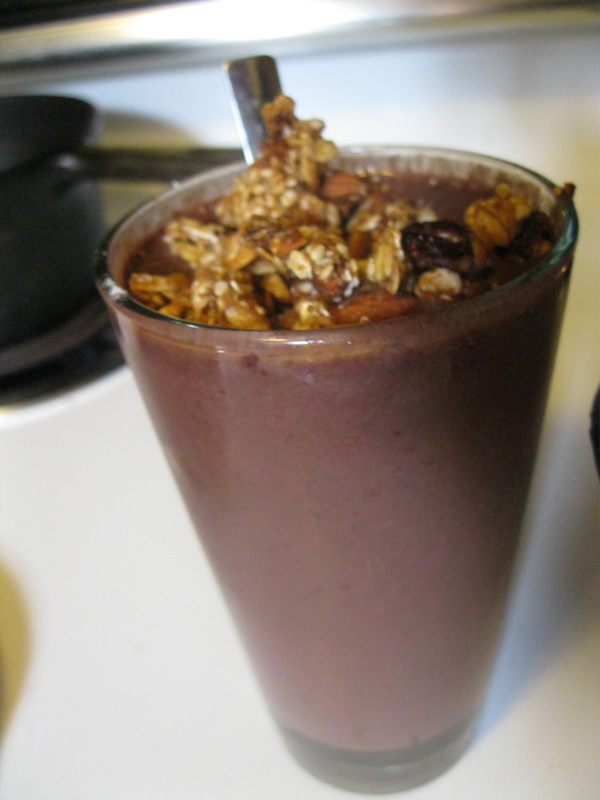 I topped mine with cacao nibs and granola. Yesterday, however, I was out of frozen cherries, so I turned to the classic standby: Peanut Butter Chocolate. One of the best combos ever, no question! Directions: Put all ingredients in blender, beginning with the greens and ending with the milk. Test for sweetness before pouring into a glass to enjoy! I topped mine with cacao nibs and a crumbled chocolate peanut butter rice crispie treat. Delish! So what makes these smoothies special? Chocolate: Kind of a no-brainer in terms of satisfying those cravings… Of course we now know that there is a physiological reason chocolate makes us feel good. Is releases feel good chemicals in our brains such as serotonin and dopamine, even mimicking the feeling of being in love. The small amounts of caffeine also help perk us up and get us ready to tackle the day. But did you know chocolate is also a great source of magnesium, copper, and even iron? Magnesium helps prevent cramping and copper and iron both help prevent anemia that can often occur in women of child bearing age due to blood loss. Greens: A great source of vegetarian iron, as well as calcium, vitamin c, vitamin a, and vitamin k. Depending on the greens, the nutrients will vary a little, but most dark leafy greens are high in these vitmins and minerals. I struggled with anemia for years, so I am always trying to eat lots of spinach! Although vegetarian iron is not as easily absorbed by the body as the iron found in meat, vitamin c aids in the absorption, so vegetarians should consume foods rich in iron with foods rich in vitamin c when possible. Cherries: A few weeks ago my mother sent me an article on the benefits of cherries in fighting breast cancer. Unfortunately, breast cancer tends to run in my mother’s side of the family. My mother was diagnosed when she was only 42 and her mother and aunt also had it. I try not to worry about whether I will get it. Instead I aim to for a healthy lifestyle that will ward off all kinds of cancers. Anyhow, apparently research has shown that women who get more melatonin have a lower risk of breast cancer. Cherries are one the the best natural sources of melatonin, as well as full of other antioxidants. 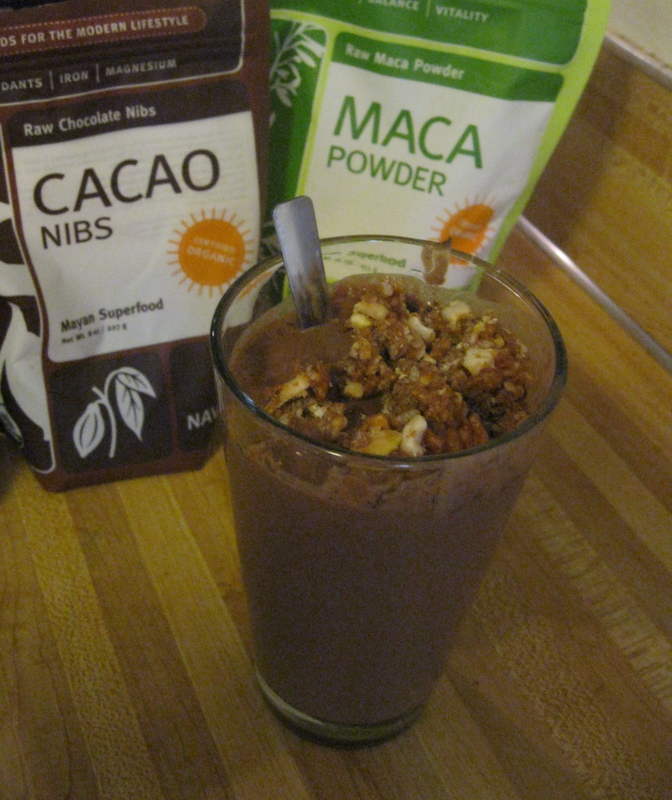 “[Maca] increases energy levels, helps balance hormones and is said to balance the endocrine system and hormones It also helps with estrogen dominance and osteoporosis due to it’s high mineral content with approximately 300mg calcium per 100 grams making it the perfect natural calcium supplement. It also contains magnesium, potassium, iron, silica and traces of iodine, manganese, zinc, copper and sodium, plant sterols which account for it’s hormone balancing effect and 19 valuable amino acids. It also contains vitamins B2, B6, C and niacin. No wonder it is called a Superfood. The milk provides calcium, which helps with cramping. If you use soy, it is also a good source of protein. Chia seeds and ground flax seeds are both excellent sources of omega 3s, and fiber. Chia is especially high in calcium also. Peanut butter provides a rich taste and long lasting fuel for the body as well as a good dose of protein. I hope you enjoy these smoothies as much as I do!